Pancit Canton Recipe is a mixture of egg noodle dish with chicken, vegetables, shrimp and Chinese sausage. In every Filipino occasion, particularly on Birthdays, Pancit is always on the menu since it is known to represent for good health and long life. Though it is only a belief, this noodle dish has been a traditional food during these special occasions. In this recipe, we are going to make the Pancit Canton; this is one of the most popular variations in cooking Pancit. Preparing Pancit Canton Recipe is simple and is considered to be a complete meal since it is composed of stir-fried egg noodles, vegetables, chicken and shrimp. You may also add squid balls if you prefer. This noodle dish has become a favorite by most Filipinos; in fact, there is a popular instant Pancit Canton brand here in the Philippines, which you may cook at any time of the day. Though, it is much better to eat the home cooked version of pancit canton than the instant version since it comprise of preservatives which is not good for our body. 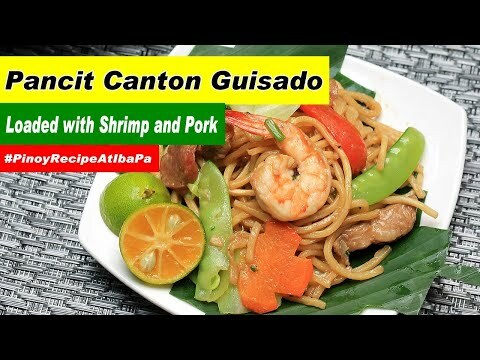 Now here is how to cook this hearty home cooked Pancit Canton Recipe. Wash, slice and measure all the ingredients needed then set aside. In a large bowl place 2 cups of ice and 3 cups water, use this to thaw the blanched veggies, set aside. In a large wok, boil 5 cups of water then blanch the snap peas, carrots, and cabbage for a minute. Drain the water and transfer the blanched veggies into the iced bowl of water. Let it cool for a couple of minutes and drain immediately then set aside. In the same wok heat the oil and saute garlic and onions. Add the Chinese sausage and saute. Then add shrimp then cook for 2 minutes or when the shrimp turns to pink remove from the wok and set aside. After removing the shrimp, add pork and fry it. Add the oyster sauce and soy sauce then stir. Add salt and pepper then cover it and bring to a boil, about 6 minutes. Add pancit canton noodles and toss it until the noodles absorb the broth. Add the blanched vegetables, sesame oil and shrimp then toss for 2 minutes. Transfer to a serving dish then topped it with scallions, you can add salt and pepper to taste. Serve Pancit Canton while it's hot. Pancit Canton Recipe is a favorite noodle dish by most Filipinos; in fact, there is a popular instant Pancit Canton brand which you may cook at any time of the day. thanks for sharing this! Its quite simple yet amazing coz ive only learned d simple pancit canton in a simplest way of cooking it Ill try it at home! God bless! That looks delicious. It kind of makes me think that this is like a Filipino version of Jambalaya. This sounds and looks delicious and I am always looking for new interesting healthy dishes to cook for my family and use chicken as much as possible as the family loves it and you can make the budget stretch with lots of noodles and rice. I will try this recipe so thank you for sharing and making it look so easy with simple straight forward recipe. This recipe looks delicious. I will have to try this sometime this week. i like that it has sausage and shrimp, i would not have thought to put those two together. this looks delicious! thanks for sharing! going to attempt this one! This looks like a dish my family would eat. i love pancit canton with calamansi! so yummy! great recipe. will make it for my next gathering. nice recipe for the day.. This is really a mounth watering recipe.. This looks absolutely mouth watering. I’ll attempt it this weekend! Sarap! We can cook this for parties!